In May last year, I read my e-mails at work, and my co-workers ran in, wondering why I’d shrieked. That’s to say, the men ran in to see if I needed help. The women ran away in case it was because of a spider. What had really happened was something I’d never expected. An acceptance for a poem I’d written. We writers are crazy folk, submitting things to markets in the insane hope one of them will actually like and accept our thing but we always assume it will end up getting rejected. It hurts less that way, you see. Only I didn’t get a rejection this time. 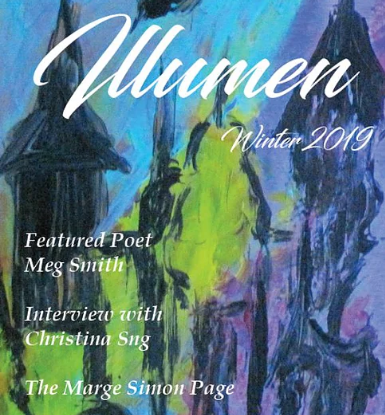 The editor for Alban Lake Publishing’s magazine for speculative poetry, Illumen Magazine actually saw something in my poem. I wrote it in the spring of 2018 under the patient guidance of Damian Jay Clay. At the time, he was feeding us poetry challenges. This time, it was a photo prompt. Everyone who wanted to take part was given a photograph of a hat. And the idea was to write a poem eflecting a persona that would wear a hat like that. I got one of those Venetian three-pointy things. But the guy in the picture also wore a mask. Stark white with a hooked nose. Reminded me somewhat of the phantom of the opera. The mask fascinated me far more than the hat. Who would want to hide their face behind something so stark and severe? The soul lurking underneath would surely hide intense passion beneath that strict exterior. I applied a technique taught to us by the very same Damian in a previous challenge, and wrote a slant rhyme about this mystery person. 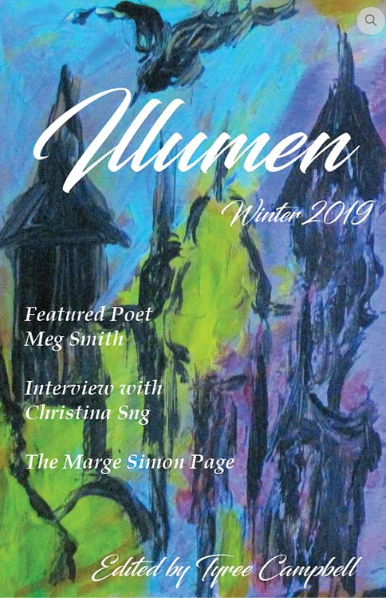 About a month later, my friend Anike Kirsten received the news that she too was going to get a poem published in the same magazine. AND in the same issue as me. To be able to share this made it extra special, and Anike and I have been counting down to the new year together. Should you buy it? There’s no should about it. Everyone makes these decisions for themselves. But Alban Lake Publishing is certainly worth any support we can provide them. The amount of work they do is not to be underestimated. They support emerging and established writers alike in a market that is hard at the best of times. Furthermore, the places that will give a home to speculative poems are still ew and far between, so Illumen becomes that much more important for poets like Anike and myself. Supporting them means supporting us and other writers, poets and artists!